Have you accidentally deleted important files, lost critical emails, or erased tomorrow’s presentation? Don’t panic. Take a breath and relax because these files can still be saved using our camera card data recovery. Accidentally deleting files can be terrifying, especially when that file contains a project for work, a school report, or other important documents. Even though it seems like the file no longer exists on your camera card, it doesn’t necessarily mean that it is gone forever. In fact, chances are very good that those files can still be recovered. With over 10 years of experience in the SD card data recovery industry, we have performed thousands of successful recoveries on memory cards. These devices include SD cards, micro SD cards, CF cards, and any other memory storage devices. We pride ourselves in leading the industry in secure and reliable SD recovery for businesses and home users alike. 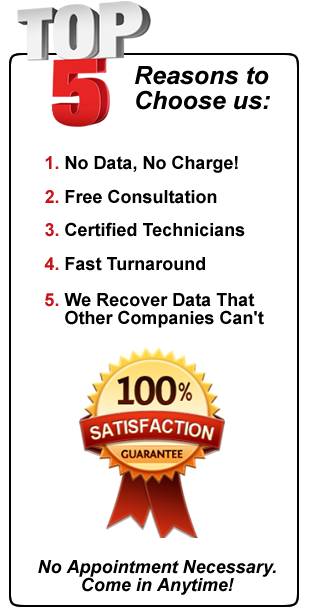 We are a specialized data recovery company, which allows us to efficiently focus our resources. Our main goal is to recover your critical data stored on SD memory cards. It is assuring to know that we are equipped with the tools for proven success. It is evident that there are many factors that may contribute to a hard drive failure. We have outlined only the most common occurrences. If your Camera Card is experiencing other symptoms, we are still able to help. We pride ourselves in our ability to recover data from any type of failure. We are not limited by the complexity, brand, size, or manufacturer of your device. If you suspect that you are in need of Camera Card Data Recovery Services, taking certain precautions can dramatically increase the chances of a successful recovery. Continuing to use a failing device can cause irreversible damage and may result in an unrecoverable drive. If your device shows symptoms of failure, discontinue use immediately. Although many factors determine the cost of data recovery, it is based primarily on the level of damage to the device. Detailed reconstruction is often required to get the device back to a point where the data can be read properly. Once the device has been rebuilt, successfully extracting the data is the easiest part! Whether its one file or a million files, the work required to get a device operational is the same. As such, the amount of data usually doesn’t affect the price. For more information about Camera Card Data Recovery & pricing, just give us a call.